Verbier is very big, very extreme and very scenic. This Swiss ski resort, part of Les 4 Vallées in Switzerland offers 412 kilometers of runs and 92 lifts on one ski pass, including the ski resorts of Verbier, La Tzoumaz, Bruson, Nendaz, Veysonnaz and Thyon. For a ski family, there is so much terrain, so many glorious high elevation peaks, and a vast efficient lift system. A family ski trip to Verbier and the 4 Vallees is best saved until your children are expert skiers, since they will want to ski Mont Fort (the highest peak at 10,925′) and Mont Gelé where the terrain is expert only – non groomed and steep. Verbier has stunning scenery and equally breathtaking extreme terrain to match. Verbier resort can get busy during peak holidays, but with 38 lifts and over 124 prepared trail plus loads of off-piste skiing, there is always somewhere new and fresh to ski. And that doesn’t include the five other villages and ski areas that are interconnected with Verbier. See our Verbier Ski Photos and Verbier Ski Videos. Verbier is French speaking Switzerland, and the on mountain experience is a blend of modern lifts and traditional chalets serving lunch on sunny decks and inside cozy Swiss huts like Chez Dany at Le Chable. Verbier’s St Bernard dogs that pose for pictures at the top of the major lifts are uber popular with kids. Parents be warned, these are for sale photos, not just for fun. Everyone loves the panorama (and family photo opportunity) at the summit of Mont Fort Glacier with incredible vistas of the Matterhorn, the Dom, and Mont Blanc to namedrop just a few of the biggest Alps. From Mont Fort summit, you can see Verbier’s speed ski track that plummets straight down the steep face, this is where top speed skiers race each year trying to beat the world speed ski record – which currently stands at 251 at Les Arc in France, top speed here to date is 219 kph. Mont Fort is also host of the Extreme Freeskier World Cup Finals. If you are an expert skier, ski the marked trail section – otherwise plan to download the Mont Fort tram. 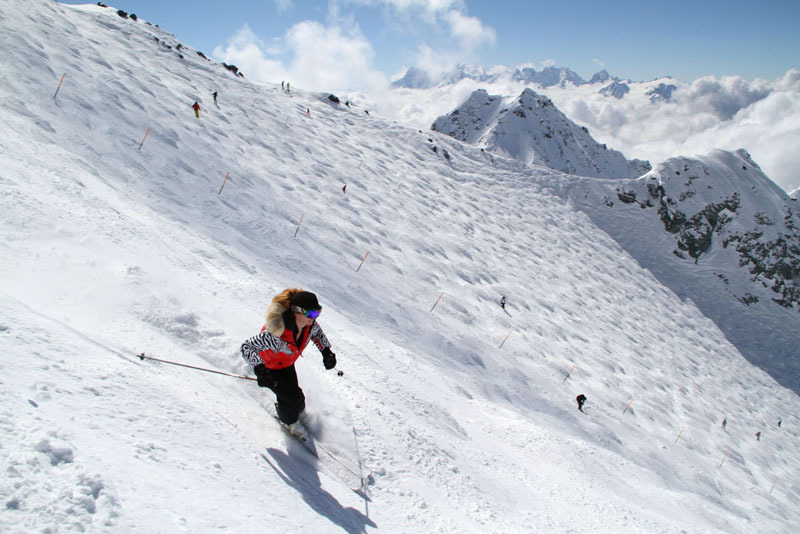 Verbier offers an excellent ski school, and guide services which are highly recommended if you are going to go off-piste and explore the uncontrolled, unmarked terrain that is available (and tempting) all over this ski resort. Park skiers and snowboarders will find Verbier’s Swatch terrain park with jumps, rails and a Swatch air bag highly entertaining. Verbier’s large ski village is charming and bustling, bigger than most ski villages in Switzerland, with exceptions like of Zermatt. There are designer boutiques next to homey bakeries’, ski shops and five star restaurants and pizzerias all in a row. For lodging in Verbier you have choices of staying in a five, four or three star hotel, or renting a chalet or apartment in Verbier. We stayed at Chalet de Flore which is convenient to the ski lifts and town, is beautiful decorated in Swiss alpine decor, with a modern twist, the best amenities and a delightful breakfast daily. Verbier makes many skiers’ Top Swiss Ski Resort List. Verbier has it all – vast serious terrain, great snow given its high elevation, extraordinary scenery, and a ski town full of distractions from shopping and dining to very lively après ski (but that’s another story…and this is a family ski site). Verbier is also part of the Vail Resorts’ Epic Pass for ski privileges. Les 4 Vallées Stats: Elevation: 10,925′, Vertical drop: 5,889′, Prepared Trails/Pistes: 254 miles, 92 Lifts. Travel to Verbier: Fly into Geneva or Zurich. Geneva is closer. Take a Train to Martigney then the St Bernard Express Train to Le Chable, then a Bus or Gondola (lift ticket required) to Verbier.